An Earth-shattering Molecular Discovery- ‘a cure all’ from Sulphur Water Threatens Anna’s life and Possibly the World! What Would You Do if You Held in Your Hands a Secret That Could Either Destroy the World or Cure It? 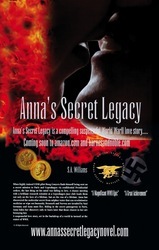 ‘Anna’s Secret Legacy’ A new novel by S.A. Williams- A Love Affair/Suspenseful espionage WWII novel. An intriguing work has entered the pantheon of contemporary historical fiction this summer with the release of Anna’s Secret Legacy—an engaging, suspenseful and provocative novel by first-time author, S.A. Williams. Anna’s Secret Legacy is a no-holds-barred, exciting and believable historical novel about love, international espionage and life and death drama set in Copenhagen and Paris in April 1940, against the backdrop of a world at war. (Soft Cover, ISBN 978-0-7414-5828-5). Laced with twists and suspense, Anna’s Secret Legacy is a fascinating love story that grabs the reader and doesn’t let go. This book is available through AmazonUS.com,WHSmith.com, Amazon UK and BarnesandNoble.com. Reporters and readers who wish to inquire more can visithttp://www.annassecretlegacynovel.com today. Website is now in 101 countries. With the current focus on the potential for good through stem-cell research and the very real opposing threat of biological warfare that continues to increase across the globe, this story about what was going on behind laboratory doors is something that is both fascinating and relevant to today’s readers. A classic WWII epic, the story, both historically accurate and scientifically credible, is told from a unique perspective, centered in Scandinavia and its significance in a world on the brink of war. Anna’s Secret Legacy is a fascinating love story that grabs the reader and doesn’t let go. To date, Anna’s Secret Legacy has been described as “a magnificent WWII epic” and “a great achievement”, strongly reflecting the author’s engaging storytelling and incredible research. Adding depth to its compelling narrative is its great cast of characters. S.A Williams’s international background uniquely positions her as a citizen of the world, who knows of what she speaks. A rare mix of artist and businesswoman, actress and science buff, writer and producer, Williams is both articulate and media-savvy. Educated in major cities across Europe, a graduate of Syracuse University, credentialed in Global Marketing and Management, Entrepreneurship and The CEO Leadership Program from the renowned University of Pennsylvania’s Wharton School as well as Global Marketing and Strategic Management credentials from Harvard Business School, Williams is also a veteran member of the Screen Actors Guild who earned The Bronze, Silver and Gold Medals from The London Academy of Dramatic Arts and has worked on the sets of such notable films as The Age of Innocence, The Sixth Sense, Fallen, Philadelphia, Unbreakable, Rocky Balboa, How do you Know and others. New York City native, Williams has also lived in Syracuse, Albany, Dallas, Rhode Island and currently resides in the Philadelphia area. S.A. Williams is working on the sequel to Anna’s Secret Legacy. For additional information, contact SAW Broadcasting at 1-800-SAW-0660 or visit the web athttp://www.annassecretlegacynovel.com Check out the secret room full of historical facts! This entry was posted in Anna's Secret Legacy, Anna's Secret Legacy Blog, Annas secret legacy novel, Banks, Barnes & Noble, Book Blog, Book Signing, Pilots, Pressroom and events, Saratoga, Scientific Discovery, spies, Travel, World War II. Bookmark the permalink. ← Local Author returns to area for Travers book signing!